Anhydrous ammonia has several advantages, including its relatively easy application and ready availability. The widespread uses of ammonia in agriculture was brought about by the green revolution, which also involved development of high yielding crops and advances in pesticides. It also is one of the most efficient and widely used sources of nitrogen for plant growth. The production of ammonia is massive in scale, consuming nearly 2% of global energy production. In 2006, worldwide production was estimated at 146.5 million tonnes of which, approximately 80% was used directly in fertilizers. In the agricultural industry, ammonia is transported from the site of production via barge, pipeline, rail, and truck to fertilizer terminals or directly to dealers. To conserve space and make it easy to handle, ammonia is kept as a liquid under pressure in specially designed bulk tanks. The fertilizer dealer pumps liquid ammonia from their bulk tank into smaller mobile nurse tanks. These nurse tanks are towed to a field and hitched up behind a tractor with a tool bar equipped with knives that inject the liquid ammonia into the soil. Once in the soil ammonia will quickly react with soil moisture and change to a form the crop can use. There are many points (from initial manufacture to final injection into soil) that leaks can and do occur, including: pressure welds, safety valves, gauges, fittings, couplings, unions, hoses and metering devices. Even small leaks can prove to be disastrous if not detected early on because they will inevitably develop into larger leaks. In a best-case scenario of a leak, imagine filling up you nursery tank one day, only to find out the next day that all your just-purchased anhydrous ammonia has leaked out from a small hairline fracture that went unnoticed. In a worst-case scenario, imagine that small hairline fracture giving way while doing a routine inspection and 100 pounds of anhydrous ammonia blasts you without warning… When dealing with hazardous chemicals, it is always better to be safe than sorry. With Pacific Sentry’s Ammonia Leak Detection Pipe Thread Tape, not even the smallest pin-hole leak will go undetected. Every union, fitting, and joint within the system can be actively monitored to ensure no leak has or is developing. 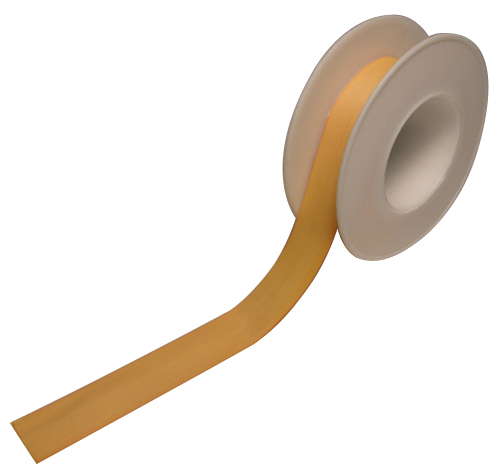 A quick glance at the color of the Ammonia Leak Detection Tape, even at a distance, will tell if your ammonia system is sealed and secure or if a leak is present. Not only does it tell you that you have an ammonia leak, but it also allows you to pin-point the EXACT location of the leak – down to the smallest, microscopic pin-hole fracture. 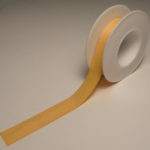 You no longer have to walk around taking measurements with an electronic ammonia meter or smoke stick, guessing where the leak may be; a simple visual inspection of the Ammonia Leak Detection Tape will provide you the information you need to determine if there is a leak and where exactly that leak is. To simply detect if there is any ammonia in a room, the Ammonia Gas Sensor provides the best and most economical solution. Similar to the Ammonia Leak Detection Tape, the Ammonia Gas Sensor allows for an easy-to-view and quick visual inspection of the sensor to determine if ammonia is present. If the color of the sensor turns green or blue, ammonia is present; if the color remains canary yellow, no ammonia is present, simple as that. 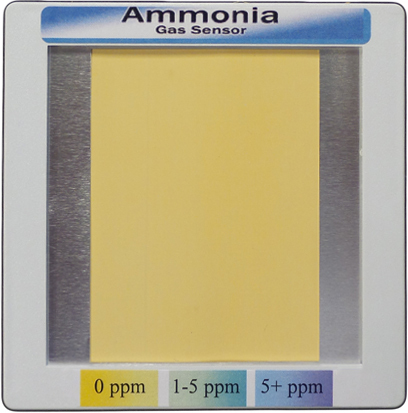 With a color reference chart, the Ammonia Gas Sensor also provides a means to determine the ppm’s ammonia level which is useful for assessing how bad a leak may be. You will be hard pressed to find an ammonia detection system as economical as this. For more sophisticated ammonia detection and monitoring of your anhydrous ammonia fertilizer operation, Pacific Sentry can develop turnkey sensing solutions that minimize the involvement of the operator. Imagine being able to constantly monitor your facility from any remote location; if ammonia levels exceed a certain level (25 ppm for example), an alert notice is automatically sent directly to your mobile phone or email so that corrective action can immediately be taken. Please enquire about this service as it is still in development.